First time ever the host of North America’s longest-running sewing show, Sewing With Nancy®, whose 40+ books have sold millions of copies, tells her life story. Nancy Zieman shares the details of the onset of Bell’s palsy and how it played a part during her school years. Zieman gives the history of 4-H’s important role in developing her presentation and sewing skills. The autobiography includes step-by-step background regarding how she began Nancy’s Notions and grew it into a multi-million dollar business. Read insights and observations sprinkled throughout from those close to Zieman. 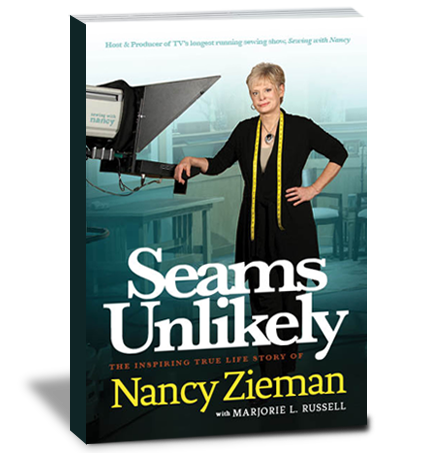 Zieman shares background and behind-the-scenes info regarding her PBS show, Sewing With Nancy. Zieman also shares the growth of her family from marriage to the birth and adoption of their boys. Special pictures section sharing images from her personal and professional life are also included. Portion of proceeds to benefit adoption charities. Read a Sample ChapterDownload here. Here is your window to the world of PBS star, Nancy Zieman: Her struggles, her strategies, her heartaches, her triumphs. Beyond Nancy’s television fame, you will discover a real person who refused to be limited by facial paralysis, chronic pain, or financial and business challenges. Woven through each page is Nancy’s constancy— and inspiring message: “If I can do it, so can you.” Read it and believe. I’m humbled by the experiences Nancy has offered to my life and the millions of the beloved friends she has inspired. WOW! Nancy’s book is a great read and brings back many great memories for all of us that have been involved in business and life with Nancy. I admire Nancy’s patience, her calm manner, her sense of humor and her family values. Nancy’s book is inspiring to read. Thanks for being my friend, Nancy. Not one to let life’s challenges derail her ambitions, Nancy Zieman has risen to the top of the sewing and quilting world through not only business acumen, but also kindness and humility. Her forthrightness and down-to-earth telling of her story in Seams Unlikely reveals her true modesty and genuine gratitude for blessings, especially family, that have come her way. I was immersed in Seams Unlikely from the beginning. 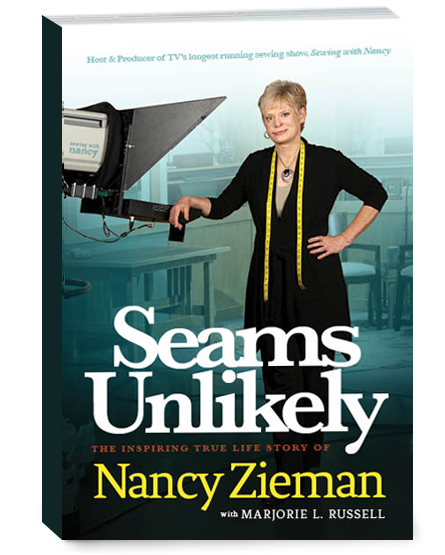 Nancy Zieman writes of her life and of her work in this autobiography which lets the reader understand her determination, her creativity and why she is so popular, respected and loved. Along life’s journey there seems to be only a handful of people you meet that have the desire and ability to encourage and lift up those around them. The evidence of this gift is not just heard in their words, but fulfilled in their relationships with family, friends, colleagues and those in need. Nancy’s creativity, professionalism and success in business deserve to be studied, but it is in the richness of her relationships that you will be most rewarded. Through the pages of Seams Unlikely, you walk with Nancy through an inspiring an incredible life journey of faith, family and perseverance that will make you not only a fan, but also a friend. Appearances are not always as they seem. As you read Nancy Zieman’s story, you’ll understand that there’s more to the life of this calm, professional woman who makes not only sewing but thirty years on television look easy. It’s an amazing revelation of carrying on through humble beginnings and serious life challenges to impressive achievements and business success with credit always to the support of others. Oh, and she is humble and able to laugh at herself too. Keep calm and carry on, Nancy–we can all be inspired by your example and life story. A fascinating look at the family, tradition, and entrepreneurial spirit that built a sewing career that has reached the hearts of Public Television viewers around the country. Nancy proves that she can stitch a story as well as a lined wool skirt. My first mistake in reading this book was starting it late at night – I couldn’t put it down and had an early flight the next day. My second mistake was in reading it on the plane where I uttered sympathetic groans, shed crocodile tears and let a few peals of laughter rip from my lungs in the company of a plane full of strangers. My third mistake was in assuming I knew everything about Nancy Zieman. Her success has been built on true grit, honesty and control of her destiny. She is the American success story. Nancy Zieman is to the sewing industry as Bill Gates is to the technology industry and Oprah to talk shows. Nancy is one of the most sought after speakers the Sewing & Stitchery Expo has ever had. Nancy is not only a legend and icon for the sewing industry; she is an educator and businesswoman extraordinaire. This book will capture your heart and your attention to the end. My heartfelt thanks go to Nancy for her willingness to support the sewing industry with such passion and grace. If you’ve ever watched Sewing With Nancy you will love this book! Nancy shares her childhood on the farm, her physical challenges, her growing career, and does it all with honesty, clarity and humility. I found the book spellbinding and couldn’t put it down. This book is pure Nancy! She’s inspired so many of us, and in Seams Unlikely Nancy invites you into her life just as she invites you into her show, with wit and wisdom and humility and joy. Find Seams Unlikely at your local sewing or quilting shop and in bookstores nationwide beginning February 2014. Seams Unlikely is available at Amazon for Kindle readers, on Google Play for Android devices, at Barnes and Noble for the Nook and from Apple in iBook formats. Enter search words, “Seams Unlikely”. Join Nancy at one of her book signings or tune in and see an interview with Nancy. 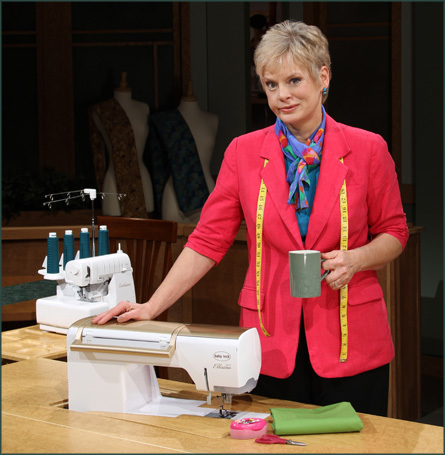 Nancy Zieman—author, designer, businesswomen, producer, blogger and national sewing authority—is the host of the popular show Sewing With Nancy®, which appears exclusively on public television stations across the United States and Canada. You can watch Sewing With Nancy® online at nancyzieman.com or from your mobile Apple® device, Click here for iPhone and iPad options. 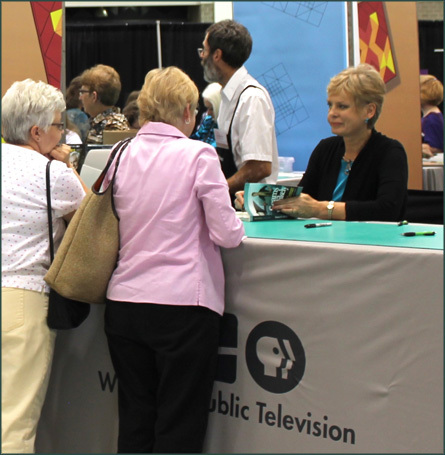 Sewing With Nancy® is a co-production of Wisconsin Public Television and Nancy Zieman Productions. 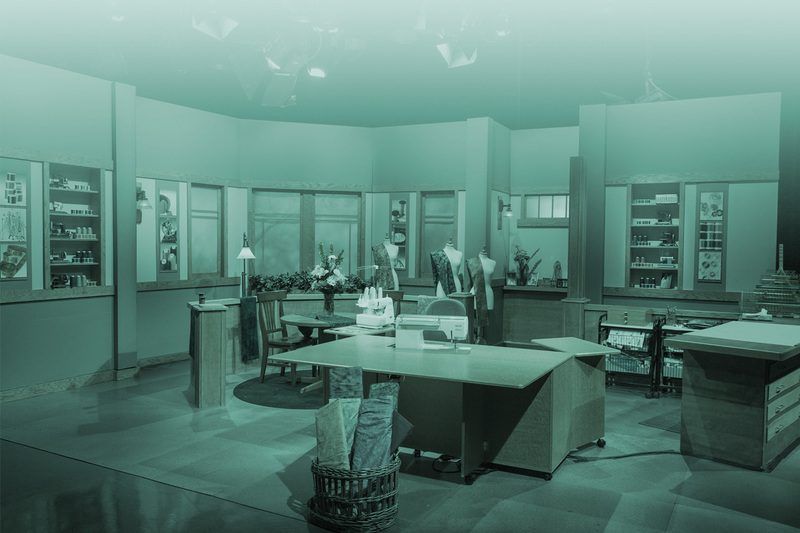 Broadcast since September 1982, the program is the longest-airing sewing series on television. Nancy organizes each show in a how-to format, concentrating on step-by-step instructions. In addition, Nancy is founder of Nancy’s Notions®, a division of Tacony Corporation. The company publishes the Nancy’s Notions® Catalog, a full color catalog containing hundreds of products including sewing books, notions, videos and DVDs, fabrics, and quilting products. Nancy is also the National Spokesperson for Baby Lock sewing machines and Nancy’s Notions®. The Wisconsin Women Entrepreneurs Association named Nancy the 1988 Entrepreneurial Woman of the Year. In 1991, she received the National 4-H Alumni Award. © Nancy Zieman Productions. All Rights Reserved.